For those who didn't know, here's a little history lesson. The Parisian Grand Guignol theatre (1897-1962) was a controversial institution which, during it's heyday, specialised in graphic, naturalistic horror shows. Director Franck Ribiere's film is about one of its most popular leading ladies, Paula Maxa, and weaves real-life events with historical fantasy. The film takes place in 1932, at the theatre's popular peak during the inter-war period. The average was two audience faintings per show, and spectators were given buckets on arrival in case of sudden vomiting. 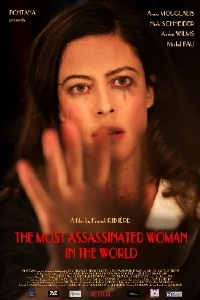 Anna Mouglalis plays Maxa, who holds the dubious distinction of having been 'murdered' on stage over 10,000 times. After the latest show, 'Un Crime dans une Maison de Fous', during which she is graphically decapitated as an inmate in an insane asylum, she meets hunky journalist Jean (Niels Schneider) who is immediately smitten by this sultry, cynical siren. Jean is investigating a series of murders which have taken place in and around Montmartre, and suspects that this disreputable theatre is somehow connected. Maxa, meanwhile, is becoming increasingly unhinged as submerged memories return to her from a murder she witnessed as a child. As the film progresses, Paula and Jean are caught up in a duplicitous plot perpetrated by the eccentric theatre director and his cronies, and we discover a link between past and present horrors. Ribiere is probably best known for producing the films of Alex de la Iglesia (Action Mutante, The Last Circus), and The Most Assassinated Women, with its bloody splatter and irreverent, almost sarcastic sense of humour and visually striking set-pieces, certainly feels as though it's been influenced by Iglesia's wicked oeuvre. Unfortunately the film does not come together. It becomes a chore. The first impression is of a lively, often seedy, and funny little film - a quirky period horror comedy with a dash of mystery - but initial impressions are dashed as the film starts to flatline after around half an hour. I kept wondering why it wasn't working, and as I took a basically unnecessary toilet break around halfway through (and considered sneaking into a screening of a popular dinosaur-based blockbuster just to escape this film) I realised it was maybe just because it all feels rather 'meh'. Mouglalis as Paula is beautiful and world-weary, often appearing privately amused, like Linda Fiorentino with a single raised eyebrow, smoking a cigarette. She looks the part, but we never really sympathise with nor particularly care for her - she is withdrawn and mysterious to the point of being cold. Schneider as Jean on the other hand is, frankly, like a blank tape, never even opened - I actually wrote in my notepad, 'bad actor'. Together they have very little chemistry, and this is fatal. I wanted to see them work this grand murder mystery together, maybe solve some clues, but instead they just seem to stare mournfully at one another, saying very little. The tone of the film is, I guess, supposed to be witty and slyly amusing, but much of the time this translates as self-satisfied. Without characters that we care for, the violence both on and off stage, while inventively executed, feels humdrum and obligatory. Couple this with a glut of minor characters and confusing subplots, again none of which feel that important or interesting, and the film ultimately becomes tiresome. Individual elements and specific scenes work well. The music alternates between giallo-inflected 1970s funk - which is always fun - and more traditional period fare. The period detail is impressive for a relatively low-budget affair, helping to give the film a distinctive look and feel also. There is a scene where Jean takes Paula to see Doctor X at the local cinematheque, and they discuss the relative merits of cinema over theatre. This was a nice scene. The Most Assassinated Woman in the World is something of a curate's egg. It's all dressed up for a wonderful night, but it doesn't really have anywhere to go, so it wanders. I certainly admire its ambition, and when it does hit its stride it's quite a dazzling and atmospheric display, but a serious lack of character chemistry keeps this film from ever truly engaging us. An air of smugness actively pushes us away.